The Kangaroos were humiliated in the opening two Tests of the four match series against India and the visiting batsmen were unable to read the lethal spin bowling of the home side. The visitors lost the first Test by 8 wickets on February 26, 2013, at MA Chidambaram Stadium, Chepauk, Chennai. The downfall continued for the Aussies in the second Test since they lost the match with a bigger margin of an innings and 135 runs on March 5, 2013, at Rajiv Gandhi International Stadium, Uppal, Hyderabad. The Aussies bowlers got a harsh treatment from the home batsmen who piled up plenty of runs while punishing the rival bowlers at their will. The Indian skipper, MS Dhoni led his side from the front in the first Test and scored his career’s best 224 runs followed by a ton from the youngster, Virat Kohli, whereas the little master, Sachin Tendulkar, also shared a valuable knock of 81 runs. Cheteshwar Pujara and Murali Vijay demonstrated a disciplined batting in the second Test while sharing a match winning partnership of 370 runs for the second wicket. 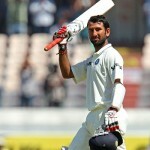 Pujara dispatched his second double hundred during his short career of 11 Tests and has almost filled the void left by one of the greatest batsmen and the wall of the Indian batting, Rahul Dravid. The opener, Murali Vijay, smashed his career’s best 167 runs while opening the innings and toyed with the Australian bowling at will. Pujara and Murali started off slowly on day two of the second Test and managed just 51 runs from 27 overs in the first session but most importantly they could not be separated. 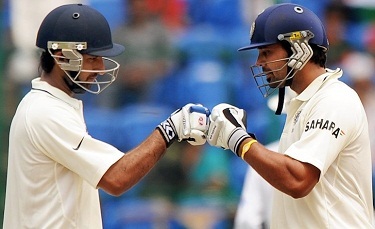 The partnership kept on blossoming and crossed the 300 runs mark at stumps without being disjoined. The duo kept on consolidating on the third day and enhanced the score to 387 when Vijay lost his wicket not before thrashing 167 runs. The Australian batsmen batted well in the first innings of the opening Test and scored 380 runs. Michael Clarke was their top scorer and plundered his 23rd Test ton by scoring 130 runs and the debutant Moises Henriques contributed 68. India piled up 572 runs in the first innings and the tourists were bowled out for 241 runs as Henriques scored his consecutive fifty in his maiden Test and remained unbeaten for 81. 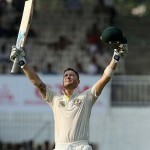 Clarke led the Kangaroos batting by scoring 91 in the first innings of the second Test and Matthew Wade scored 62. India batting was once again unstoppable, scored a mountainous 503 and the innings of the visitors was folded back for just 131 runs. The Australian batsmen were mesmerised by the quality spin bowling of the Indian spinners who grabbed 34 wickets out of 40 in two Tests. Ravichandran Ashwin is bowling at his best and has grasped 18 wickets, Ravindra Jadeja was also impressive with 11 whereas Harbhajan Singh shared 5 wickets. Clarke hopes his batsmen will follow the Indian batsmen especially their young guns, Cheteshwar Pujara and Murali Vijay, in the remaining two Tests and get positive results for Australia.